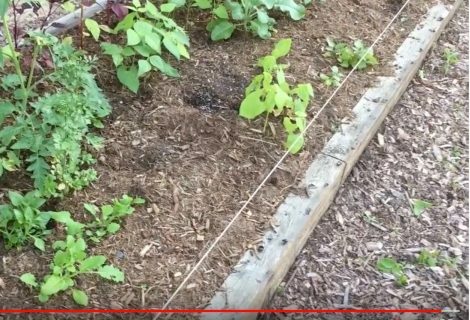 This post is a Food Forest Garden Update WV April 2017. It shows my two-year-old food forest, goes over some of the plants in the garden, and shows some of the supporting features in the forest garden. What Plan? There was a plan to put a food forest in a berm that the construction folks left when they put in my garage. I had just started to learn about food forests and really liked the concept. I built mine by just going through catalogs and purchasing plants that I like and putting them in. This is not the way to properly plan a food forest, but for my small area it has worked out ok.
One of the support systems is a rainwater harvesting system that collects water from the garage roof, filters the water, and stores it for future use. This water is used to water the newer plants in the food forest in the dryer times of the year. I have a string with wire running through it that is connected up to a solar charge controller. The string runs all the way around the food forest as well as two runs up the center. The string is charged with 6000v in the winter and 9000v in the summer and so far, it has done a wonderful job of keeping the deer away. Many people ask what a food forest is. It is basically an assembly of plants put together in a way that they will grow up and be a forest. But instead of just any old forest, most of the plants are edible, so it ends up being an edible food forest. I highly recommend you watch the video to see the plants and get a little more detail on the various plants in the food forest. Here are some of the plants that I talk about in the video; sand cherry, chestnut tree, raspberry, elderberry, mimosa tree, aronia, and plum tree. I also go over; cornus mas dogwood, fiddlehead ferns, comfrey, blueberry, quince, nanking bush cherry, gold silverberry, rosa rugosa, figs, mulberry, and many more. Check out the video below titled Food Forest Garden Update WV April 2017. Thanks for watching the Food Forest Garden Update WV April 2017 post. Please give us your thoughts on Food Forest Garden Update WV April 2017 by commenting below.